And spoke as we thought was best." - "The Man from God Knows Where"
In July 1953 the Savoy Cinema in Newry was destroyed in an explosion. The posters on the outside had been proclaiming the arrival of a documentary about the recent crowning of Queen Elizabeth II, "A Queen is Crowned." The documentary condensed the 8 hour coronation proceedings into 79 minutes, thus providing to those who could not see the event in person an opportunity to watch it in their local cinema, in crisp and then-expensive technicolor, accompanied by Lawrence Olivier's narration. The pomposity of the script, no less than the grandiose coronation itself, elicited cringes from nationalists, for whom the coronation was a cause for protests across the country against partition and the general misery of their lot in the North. None of the cinemas in the south would show the film, so the "shoneens" -anglophilic Irishmen, who were mostly in Dublin- who wished to see it had to go north to cinemas in County Down and Belfast. To remedy the latter, the railway which acted as the primary link between the two capitals was cut. To remedy the former, the cinemas were destroyed thus, the IRA hoped, rendering the island coronation-free. When it did explode, the balcony collapsed, the roof was blown apart, the seating area was destroyed, the screen badly damaged, and the front wall and foyer were blown in. The police, in a different section, were unharmed although the building was gutted inside. The owners did emergency repairs and announced the proverbial show would go on, even if not in time for the scheduled opening. The damage was initially put at £3000. When it was rebuilt, a wide screen was installed and the general consensus was the new cinema was a great improvement on the old one.(5). The bombing was widely reported in the papers. The IRA worked a similar explosion at a cinema in nearby Banbridge, following the same technique, but like most sequels it did not live up to the original either in damage caused or public stir elicited. There was no onslaught of condemnations; in fact, rather than outrage, the public reaction seems to have been one of mild amusement or ridicule. The attitude was well summarized by one commentator who, writing about the attacks, described up the IRA and its operations as merely "...an expression of bad taste, an eruption of Irish exuberance that went a bit too far." Additionally, no one was hurt, something which we shall see later on was a defining factor. "That the Headquarters training classes in engineering are proving successful in turning out efficient Engineers was clearly demonstrated in some recent Army operations, e.g the destruction of Newry cinema, extensive damage to Banbridge cinema and the blowing up of the railway bridge and cutting of the line on the Armagh/Louth border. "The section which carried out the operation on the Newry cinema did a splendid job of engineering by causing the maximum amount of damage to their objective whilst doing a minimum of damage to adjoining property. "Given the materials, almost anyone can cause an explosion; it is only the trained Engineer who can estimate the amount of explosives to use and place the charge where it will be most effective." They further said the unit was to be "commended" for avoiding detection by the police. All volunteers received a course in the dangerous art of engineering as part of their basic training, which was organized locally. But a chosen few were taken to the IRA's haunts in the country and given special training; a cut above the usual courses, run by the army headquarters, and taught by men experienced in the field. A bomb-battered Armagh veteran of the late 30's, Seamus Trainor, did valuable work training engineers in the North during this period. The new engineers would then use their knowledge at home and pass it on during local training sessions. Joe Campbell worked as a cobbler repairing shoes at the family business, "Campbell's" on Castle Street. In his 30's, he lived at home with his father Patrick, sister, and brothers Teddy, Lennie, and Bobbby, who also worked as cobblers. "Wee Joe," he was known to the locals, with a signature "(walk) with a roll like an overweight jockey"
While probing the area following the Savoy explosion, the police found 12 sticks of gelignite hidden in the chimney flue of "Wee Joe's" bedroom. Joe, his father, and brother Lennie were all arrested along with a Michael Hollywood who was on the premises. "I have taken responsibility for the stuff found. I exonerate from all blame these other people who could not possibly have known I had the stuff. Furthermore, as a soldier of the Irish Republican Army I take no further interest in this case." Joe Campbell had the dubious honor of being the first sentenced Republican prisoner of the 1950's. Other volunteers and activists had been interned, but internment by nature was applied to both innocent and guilty alike and the Army was not inclined to justify the government's actions by claiming them. Being sentenced made an otherwise secret membership into a public badge of honor. While not his native area, co. Louth is widely considered to be Ireland's El Paso and in this aspect Joe was familiar with the place. Lying directly across from South Down, separated by a river that creates the border, it is a haven for volunteers going into and out of the North, arms dumps, "dead drops" in the fields at which explosives were left and picked up, and all forms of nefarious activity directed at removing the border, and the Newry unit played a central role in the Northern side of these operations. Just the Easter prior to his arrest he was part of a color party the South Down brigade sent to Dundalk's Easter commemoration. As candidate he did not have to exert himself in any way; all he had to do was be in prison, and the people in SF would do the rest. And they did with gusto. "The cause of Ireland is the cause of Campbell" became a slogan proclaimed by supporters and scrawled on walls. 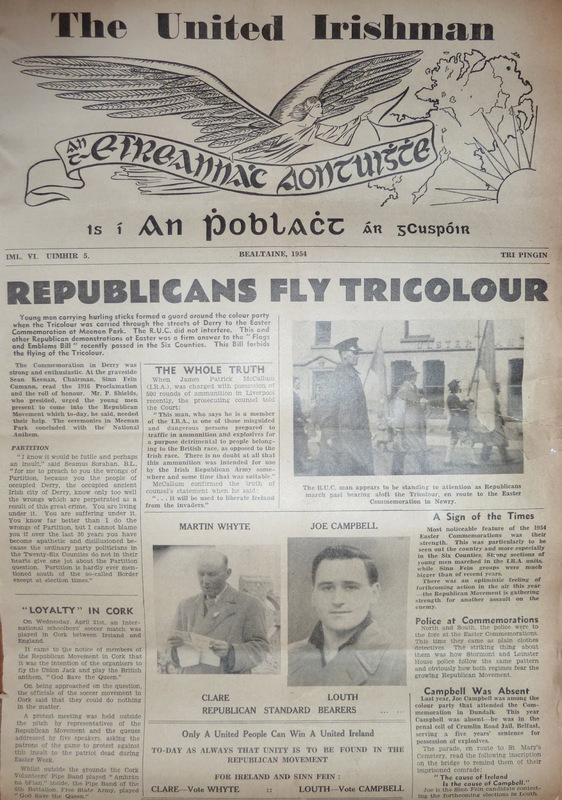 (10) "Joe Campbell... is a living symbol of Ireland's demand for unity and independence," an appeal read, "Show your support for this demand by helping in every way you can to have him elected..."(11). Dan Sheridan, an Old IRA man and still the official contact for those wishing to join the movement in South Down, was "one of the most active campaigners." But for all their work, he only received 1400 of the votes, the majority going to Fine Gael. 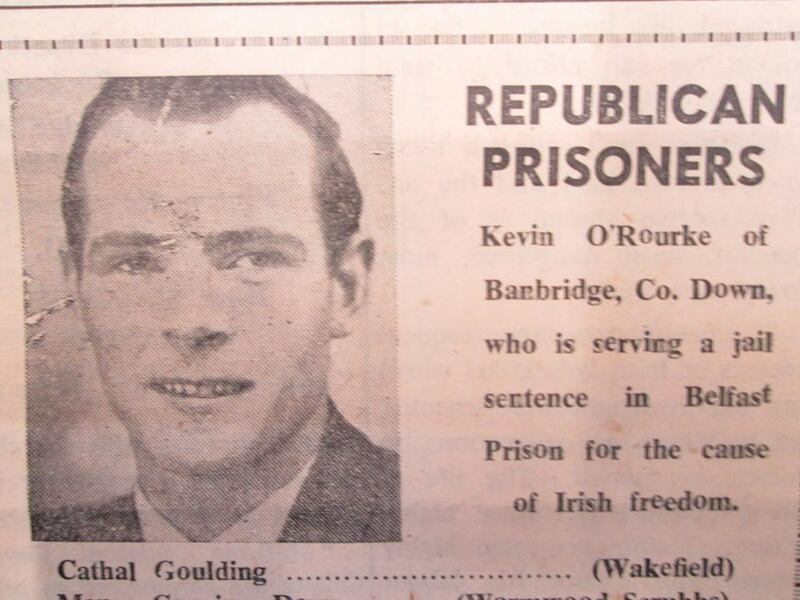 His imprisonment also precipitated the creation of an informal group to collect funds for the dependents of Republican prisoners, called the Republican Aid Committee ("An Cumann Cabhrach"). As the number of POWS increased, the group morphed into an official charity that operated well into the 60's and at its height collected tens of thousands of pounds from various quarters. The incident had an interesting economic sequel. The damages in the end totaled £8,200. These were levied on the people of Newry and Warrenpoint, to be paid at an extra 1/4 to 1/2£ each. It was a Glasgow newspaper, the Scots Independent, which pointed out "Either the citizens are innocent, in which event they are being unjustly punished, or they are guilty, in which event the case for partition falls apart at the seams." But perhaps significantly there was no public protest from those paying it. A WALK UP MARGARET ST.
Aiken already knew Rowntree; he passed over the others and approached O'Rourke, who gave his name as Patrick Delaney. "I'll have to search you" Aiken said. O'Rourke replied in the negative and pulled out his wallet (which was not that of a Patrick Delaney) to explain the bulge. He was caught unprepared, and no doubt frightened at the increasingly realistic prospect of going to prison. While the policeman looked over his wallet, he stepped back and then ran away. Aiken gave chase but O'Rourke was a good distance ahead; Aiken fired a warning shot past him and shouted "Come quick" to those in the car. O'Rourke ran down Water Street to a short wall where he dumped the fuses and the .38. The policemen in the car, watching this, were faster than he was and as they pulled up, one grabbed hold of him while another proceeded to search him. Aiken walked over to the wall and found the gear. "I now know why you ran away." He said. "I take no responsibility for that" O'Rourke declared. The authorities were afraid of display that would be created by a public trial, so it was moved at the last minute to the Newry RUC barracks. "The dogs on the street" found out and a crowd formed outside, raising a commotion and trying to peek through the drawn shades (barracks were a far more informal institution in 1954). Had the shades been open they would have watched a five minute scuffle between Kearns and O'Rourke, who refused to stand when required, and the guards trying to make them do so. When charged, they one by declared they had nothing to say until it came to O'Rourke. "I take all responsibility for the stuff found" he announced. Unlike Wee Joe's case, it was not as simple as that, as the circumstances in which the stuff was found was quite different from hiding them in a chimney. The four looked like IRA men doing IRA business but, incapable of charging them with that fact alone, the prosecution was pinning possession on all four. "Under the law, possession by one means possession by all" one of the detectives explained to them. The three others made it quite clear they would have none of this. Seamus Kearns declared: "I am...charged with having the articles with intent to endanger life or cause injury to property. If you admitted that I had none of the arms except the two that God gave me, how could you explain that I could do these things?" Jim Rowntree: "The prosecution witness already admitted that I bad none of this stuff in my possession Therefore I could not endanger life. This is the third time that he has asked for a remand, and, as yet, not one basic piece of evidence has been submitted to substantiate these charges. Am I held on suspicion or on evidence?" Rowntree: In other words, you are just a stooge or a puppet. The Magistrate: I cannot allow that as a question. Rowntree: This is supposed to be a fair trial but it is just a mockery and a complete denial of human rights. The District-Inspector: This man is making a platform of the proceedings. Rowntree: I cannot help it If he has not the intelligence to answer the questions. One afternoon in early September, Rowntree, Kearns, and Loy were told to get their things together. They were taken to the head office of the prison where rail vouchers awaited them. "Why are we being released?" Rowntree asked. Convoluted and sometimes ridiculous legal battles like this were a fact of life for northern Republicans. They came and went and were quickly forgotten in the grand scheme of things. It would not be the last time young Loy saw the inside of the Crum. Rowntree was never again arrested and remained O/c until he stepped down in 1958. That left O'Rourke in the belly of the beast. At 30 years old, he was living at home with his widowed mother and siblings on a 25 acre farm, which he helped run. For extra income he occasionally worked as a bricklayer. He had no trouble with anyone, no history of arrests, republican or otherwise, and this incident came as an anomaly in the record of an otherwise placid citizen. He had a total of 6 hearings, all following a routine of refusing to stand up, being "mute by malice," and protesting the illegitimacy of the court. He refused to question the witnesses- the policemen who arrested him- although he did occasionally address the jury. And not without some effect; at his final hearing at the Belfast Assizes in early December the jury took over 90 minutes to reach a verdict and came to the conclusion that there was not enough evidence to prove the .38 belonged to him. The prosecution conceded this point, and proceeded on the second charge, relating to the detonators ("unlawful possession of articles), for which another trial was held within the week and a new jury was brought in which found him guilty. "I cannot leave out of account the use which could be made of a pistol, fully loaded, like this, and the use to which detonators of this kind can be put. It seems to me you were on some errand of an unlawful kind, and it is necessary to show quite clearly that this kind of conduct will not be tolerated." As for Kevin, a volunteer from Cork remembers that he too "was a gentleman by nature." While on A Wing (for the long term sentenced men) he shared space with some volunteers from the Cork brigade for whom "he was a tremendous help to us during the remainder of his time explaining the do’s and dont’s of prison protocol, what was safe to eat, how to deal with the screws and in general keeping us up to date with the prison routine. "(26) He also was eventually interned, and was joined by his brother Enda. They ran once more for Sinn Fein in North and South Down in 1959. The one thousand faithful few turned out for Joe, but Kevin's popularity shrank to 6,000 votes, Orr once again coming ahead. Sinn Fein's poor showing is generally attributed to disappointment with the way in which the campaign progressed. 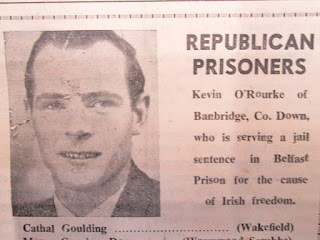 As the campaign, and support for it, ramped down the government felt comfortable enough to release some of the internees, leading to freedom for Wee Joe and Kevin in November and December 1960 respectively. (27). Upon imprisonment, all rank was lost and the men went back to being "only" volunteers. But understanding the personal ordeal prison entails, the IRA has always afforded members the option of either reporting back to their unit, or going their own way, and nobody thinks less of them if they choose the latter. Kevin returned to work on the family farm, and we hear of no more republican activities from him. Joe returned to work at the cobbler shop on Castle street. 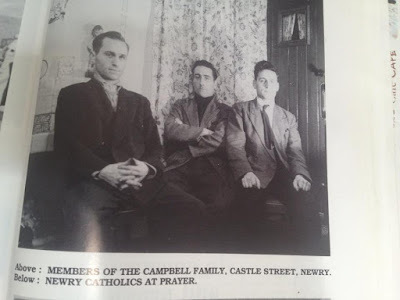 He also reported back to the Newry unit, which had been whittled down by arrests (over 2 dozen members were interned or sentenced) but was nonetheless intact and in need of experienced men as always. He had missed most of Operation Harvest but republicanism was his life and there were larger undertakings. In an interesting postscript, one of Queen Elizabeth II's acts on the 50th anniversary of her coronation in 2003 was to bestow the status of "city" on Newry. *-There is a disparity in accounts. The newspapers and IRA documents unanimously hold that it was blown up before the film was shown. Locals seems to remember it happening after the film was shown. It was blown up after a film concluded, which may have led to the confusion. Many thanks to Oliver McCaul and Brian Patterson. 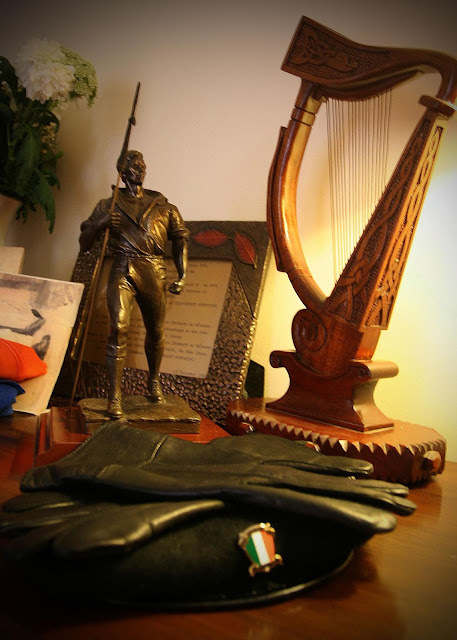 Photo at top: Joe Campbell's beret and gloves, harp he made while in the Crum, and Croppy boy statuette presented by comrades from Operation Harvest in recognition of his service.